[/u]I AM TOTALLY CRAAAAAAAAAAAAZY! XDDDD LOOOOOOOOOOOOOL! I just have problems with everything......family, school, friends, trouble with love...In the last time my life was really black. But I met a new friend. He was (maybe still is) depresive too, so he started to help me. Everyday he write me a short message like " be stronge", "be happy", "live".........the last message was " be colorful" xDD I must so laugh! He explain me that every wrong have color xD Is not only black, it have other colors too and when we mix them we got a......"something xD"
Not much to explain...just a vectorline with colorfull coloring ;) The scan is colorfull too but I just and other colors ;) and haftone. EDIT: Elite? for this? xD OMG! Thanks a lot! First to comment! AAAAAAAAAAHH! A abstract one, awesome! I like the real colorful version more, cuz...yeah it's colorful! xD The boy is cuuuute! And hey, your vectors are totaly perfect now, so smooth lines and nice coloring. I luv it! Be Colorful is such a strong message. This is a good wallpaper, thank you for sharing. The way you vectored the character is fantastic, I just wish you repeated the textures and colors throughout the background; the background looks so stark in comparison to the character. Maybe several laywers duplicated and overlaid would have made the colors more vibrant, and I'd love to see how this looks with a grunge texture. Really nice work! The softness of the vectoring works well with the half tone. The bg is a little bland, but I'm afraid that much more could have made this too busy. Good job! I must say this is the nicest wall I've seen using soft color halftones. Faved. 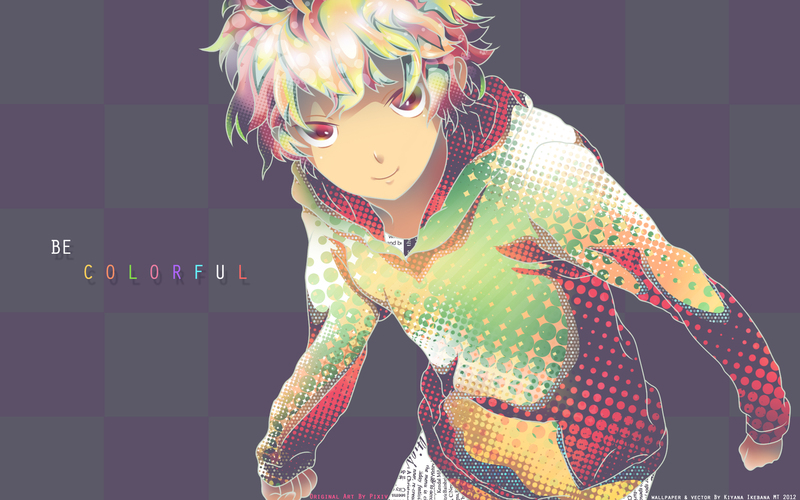 OMG YES, finally a very colorful wallpaper that doesn't gouge out my eyes! There are so many halftones that look so vibrant and I love seeing all the small details you put into this (like the newspaper clippings on his pants and the bokeh in his hair). I'm glad you got Elite because this didn't deserve to be deleted at all. I really like the usage in colour for this *u* I love colourful walls, though I think with the amount of different colours in here, it would've been better to have the colours brighter and saturated instead of the more pastel tones they have now. i really enjoy the simplicity and colour controls of the design. I love this. By creating the simple background, it turns all the focus to the character who is just dazzling. Love the various patterns and colors throughout!